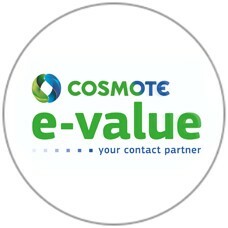 COSMOTE e-value, a member company of the OTE Group and market leader in its industry, provides integrated Contact Center Outsourcing services to the Greek, European and International market. With 19 years of experience in the contact center services field, state of the art infrastructure and over 5,500 employees, COSMOTE e-value fully capitalizes on the opportunities that are provided by new digital technologies so as to offer on a 24/7 basis, a full range of services including sales, helpdesk, digital and social media care, customer care, consulting services etc., fully customized as to meet each customers demanding needs. The company is registered in Xanthi, whereas its branch offices are located in several sites in Attica, such as Agios Stephanos, Dafni, Athinas and also in Kerameikos area, where the headquarters are based. Since 2014 it has been developing commercial activities also in Romania, under the name e-Value International. With over 1100 employees in Romania and presence in many cities including Bucharest, Brasov, and Ploesti, e-Value International has undertaken several important projects for both local and international customers.